There were 685 press releases posted in the last 24 hours and 154,060 in the last 365 days. WASHINGTON DC, WASHINGTON, UNITED STATES, July 10, 2018 /EINPresswire.com/ -- These days, more and more businesses are embracing the concept of big data. Here the big data is helping the companies overcome the challenges to grow and to improve the productivity. Today, every start-up, small and medium businesses are searching out for the big data companies. 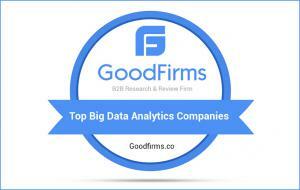 Thus, GoodFirms publishes the Top Big Data Analytics Companies worldwide that assist organizations to have intelligence consultants to provide their businesses with a competitive advantage. Combining the AR & VR with Data Analytics brings out a whole new level of business. This makes helpful for the businesses on an internal level, by extracting key information and making it effortless to understand. This can be a benefit which can be intensely felt in every industry, right from the retail industry to services and utility firms. Here at GoodFirms, you can check out the list of Top Augmented Reality & Virtual Reality Companies that offers inventive solutions to their clients. B2B GoodFirms is a Washington, DC, based company. It is a worldwide research, rating and reviews platform that assist the service seekers to link up with the top IT and best software companies that have successfully facilitated the entrepreneurs with software solutions as per their business needs and have created a most excellent work record. Before indexing any firm in the list of Top IoT Development Companies or in another specific field each of the agencies is evaluated using a scrupulous research methodology that includes en-number of qualitative and quantitative parameters as well as considers the on-hand experience in the same domain, market penetration, and client reviews. GoodFirms not only support the service buyers but also encourage the service providers by inviting them to join in the on-going research process to get listed in best IT and software development companies. GoodFirms is a Washington, D.C. based research firm that aligns its efforts in identifying the most prominent and efficient big data analytics companies that deliver results to their clients. GoodFirms research is a confluence of new age consumer reference processes and conventional industry-wide review & rankings that help service seekers leap further and multiply their industry-wide value and credibility.